From the opening bars of the memorable theme along with Tom Cruise hanging from a plane door taking off “Mission Impossible--Rogue Nation” is a winner. Checking your logic at the theatre door as you must in any action thriller--come on, 6 guys shoot at Cruise and he walks (well runs) away while he gets 4 rounds off and kills 4 guys!--the chases whether by cars, trucks, motorcycles and the numerous fights including fists, thighs, knives along with double crosses and who’s on whose side will hold your interest. The story, also the director, by Christopher McQuarrie is sharp, basically straight forward making it easy to follow, and includes all the standard action scenes but done with a bit more than most. Tom Cruise delivers with a strong performance physically and emotionally while Rebecca Ferguson as either his friend or his enemy equals Cruise in all the scenes and I don’t think there is a guy reading this who would want to get in a fight with her. Simon Pegg as part of Cruise’s team gets in quite a few funny bits and lines while Jeremy Renner and Ving Rhames as the other members of the team don’t have much to do but impress whenever on screen. Alec Baldwin as the head of the CIA, Simon McBurney as a member of the British intelligence group, along with Sean Harris as an impressive villain, along with a more impressive enforcer called The Bone Doctor played by Jens Hulten and various other supporting players add to the texture of the film. Yes you might expect Hitchcock to show up, or hear Doris Day sing “Que Sera, Que Sara”, in the Vienna State opera House or bump into Humphrey Bogart in Casablanca but there is a good feeling along with the familiarity! 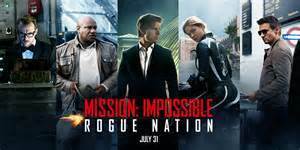 “Mission Impossible: Rogue Nation” is about 10 minutes too long and the underwater scene one of many illogical ones but the fact remains this is a fun adventure film that you will readily enjoy sitting back and get lost in what Hollywood does best--entertain!